Parking spaces in front of the Albany Carousel. Off-street parking was not required. Now that parking for the Albany Carousel has become an issue, people keep asking why off-street parking was not provided when this attraction was built. The answer is that it was not required by the city’s rules. The planning staff at City Hall approved a site plan for the carousel on May 2, 2016. The staff report for the approval notes that section 9.020 (6) of the Albany Development Code exempts new buildings within the city’s Downtown Parking Assessment District from the off-street parking requirements elsewhere in the code. And as a result, the staff report notes, “No off-street parking will be constructed.” If anybody worried about how that might work out with a facility that hoped to attract thousands of visitors, the report does not mention it. The report pointed out that as part of the carousel construction, nine parallel parking spaces on the north side of First Avenue would be replaced by 13 back-in angled spaces, and that was done. I agree that there was no requirement for parking. That just means that they didn’t have to by law. It does not, however, keep them from planning for it… or the city planning either. I will have no part in planning for parking for the Carousel. Now if all of downtown needs parking, then that is a different thing. We will just have to wait till after the big rush (to see what the) need is and then look at the real need… Let’s plan for that, after we know. Kellum acknowledges the City had no obligation because “they” didn’t have to by law. The problem is, Kellum is THEY. He is an elected member of Albany City leadership. So, when he says “they,” he is included in the group he castigates for having not planned properly. He is responsible for ALL planning as he is an elected leader. His stance is confusing. He berates the Council and other City leaders for not having planned parking for the Carousel and in his very next breath he says he will have nothing to do with planning for Carousel parking. Yet, he is charged with that very task – to make certain that Albany runs smoothly. Kellum wants it both ways. He fancies himself to be a “steve Bannon-type” outsider, determined to smash the status quo, yet he is, by definition, precisely the definition of Status Quo. Kellumis charged to work with other elected Council members to effectively govern the community. In fact, he probably swore an oath to do so. But his own words prove him largely ineffective. This schizophrenic approach to governance demonstrates that Kellum, in spite of having been re-elected, is not ready for prime time when it comes to leadership. You cannot complain about the system, Kellum, when you are part and parcel to everything in that system. Stop pretending to be a rebellious outsider when all you really are is an insider-reactionary sending confusing messages to the citizens of our fair city. While I do disagree with Rich much of the time on substantive issues, he can and should voice his opinion. We’re both in the same boat – we have to garner 4 votes or it’s all for naught. Try to keep up Hartman, the they is the Carousel who doesn’t have to put in parking…. I thought better of you when you only whined about your neighbors staying in an RV while they were working on their house.. Or when you complained about out of state RVS staying in Walmarts parking lot like they can in a lot of other places.. I will not worry about an old liberals view of leadership because you do not have any…. So, I guess we can assume that Kellum will continue to do little or nothing to fix the problems he helped create. Kellum had every chance to demand the carousel developers provide a parking solution before the construction was permitted, yet Kellum did nothing. Then, Kopcyzinski acts as his chief defender, letting us know one must get 4-votes to do anything in Albany. So we have a City Council that has had the same people seated for years and it seems getting 4-votes is nigh-on impossible. If this is what Kellum calls successful leadership, then I’d hate to see what failure looks like. He apparently could not muster the votes needed to prevent the current parking debacle or he didn’t even consider the possibility. Either way, his protestations ring hollow. Plus we have learned a great deal about Kellum. He won’t do anything to alleviate the parking problem even though his lack of action led to the problem in the first place. It’s the same as his take on the Walmart Overnight Camping situation. The store agreed to not allow overnight camping in their parking lot and they have signs posted throughout the lot saying so. Yet every morning you can walk the Wally World lot and see the campers outside brushing their teeth, urinating on the bushes and allowing their dogs to defecate on the sidewalks, etc. still, Kellum refuses to acknowledge the problem because he’s already done as much as he’s able to…real leadership for Albany. So,it’s business as usual from Councilor Kellum. He’s done all he can. He’ll do no more. That’s how City Leaders succeed. come on Nico…. how about a solution instead of just whining… or spending other peoples money to do what you want done.. I thank Kellum for straightening out my thinking. However, that still doesn’t explain a few things related to Carousel-Parking issues. With all the hype and hoopla the Carousel generated for years in advance, one would expect the City, which manages streets, parking, etcetera, would have shown a great deal of interest in what the Carousel would mean for downtown. In fairness, the Mayor did propose chasing the USPS out of their building, then using that space as parking. You can argue the merits of the Mayor’s idea, but at minimum, it was looking forward. I am too lazy to look up the Public Record, but perhaps, if a Council vote was required to expand the number of downtown spaces from nine to 13, Kellum may have voted Aye on the issue, adding nearly 31% to downtown parking, solving the problem. That’s leadership. Another example of why this whole thing was a ludicrous idea. Now that the $ are spent we are looking to displace another business/building for parking. Isn’t this a little cart before the horse? As for displacing employee parking, are you kidding? Of the few people actually still employed in old downtown they may even have MORE issues trying to work in the very area the city is desperately trying to promote? And asking the post office to move is even more ridiculous. You asked for it……now live with it. Anyone involved with passing section 9.020 (6) should be jailed for misappropriation of funds for whatever they were paid. Why are so many people in public service in favor of short-sighted and stupid rather than planning ahead for what anyone with half a brain and a car knows is going to be a problem? like the perfect action to take. Seriously though, isn’t parking an issue during downtown events such as River Rhythms? I’m with Kellum. No need now. Later will do. Scrape past the hectic holiday season (maybe Amazon.com will eliminate the need for downtown merchants altogether) and things will settle into a routine. Routines are far easier to plan for. I agree with one little exception: maybe Amazon.com will eliminate the need for big box merchants altogether. Is this code not discrimination against other new businesses in the Albany area. When was the downtown exception put into place? Small to enormous parking lots owned by every store or little group of stores are what gave us the vast, ugly, unwalkable wasteland of Santiam/Pacific/9th/etc. 1 – Frequently-running shuttle bus from somewhere like the Dead Safeway. 2 – A parking garage. But, see “Parking garages are getting a second life as places for people” for why this may be a short-term solution. I will provide a counter-argument. 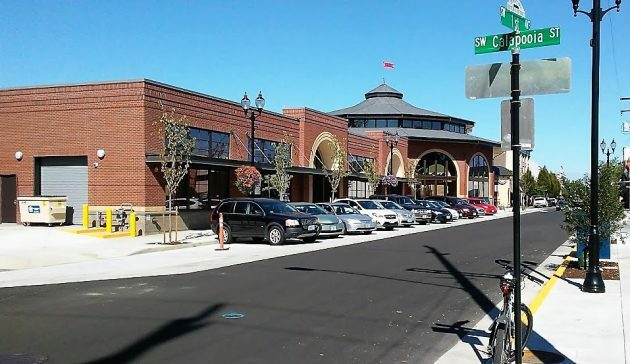 In high occupancy areas that want a concentration of businesses, restaurants, and other attractions, like a down-town area, it makes sense to not want a bunch of small parking lots taking up space where we want tax paying organizations. You want these businesses packed in as small as area as possible. Obviously, there has to be a plan for parking, but the city should address this with larger lots on the outskirts of this area, plus convenient street parking.